In 1923 the President of the largest US steel company was Charles Schwab, the President of the largest US gas company was Edward Hopson, the President of the New York Stock Exchange was Richard Whitney, the greatest wheat speculator of his day was Arthur Cooger and the Great Bear of Wall Street was Cosabee Livermore. They were considered some of the most successful people in the world. Charles Schwab died a pauper, Edward Hopson went insane, Richard Whitney was released from prison to die at home, Arthur Cooger died abroad, penniless and Cosabee Livermore committed suicide. The 1923 PGA Champion and winner of the US Open was Gene Sarazen. He played golf until he was 92, passed away in 1999 at the age of 95 and was financially secure at the time of his death. to them there is no end. It was early morning, 12th April 1912. The house was slowly coming to life and George was wide awake, in his excitement he had hardly slept. Some last tearful farewells to the early morning maids, a final check that his tickets were secure in his pocket and quietly he slipped the safe moorings of 11 Queens Gate, Kensington and his life as a footman. Emerging from the collonaded porch, he touched the iron railings one last time, turned left and then right onto Prince Consort Road, heading for Waterloo and the 07:45 train to Southampton. He was dressed in his Sunday best suit and wearing a Sunday smile, he did not look back. The city was already bustling with the clatter of hooves and the too familiar smell of horse manure, soon to be replaced by the salt sea air he had known as a boy. 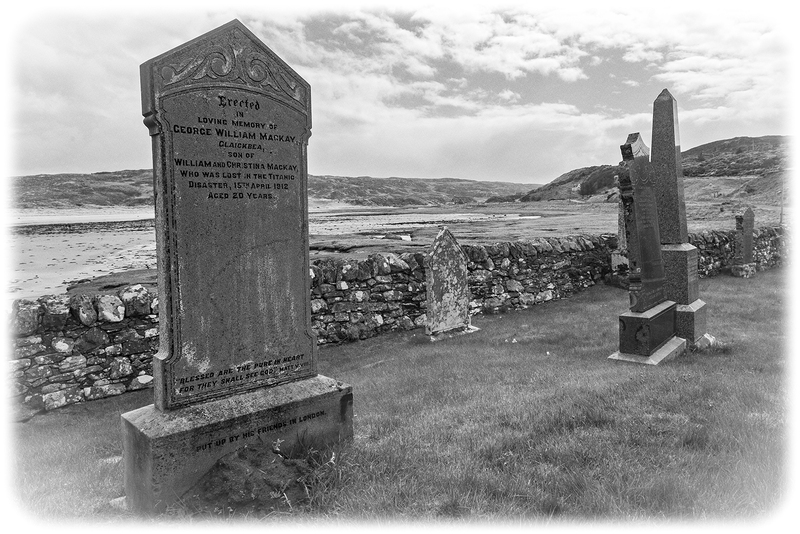 The young George had only just turned twenty but already he had travelled far from his humble beginnings on a croft near Tongue, in Sutherland. One of twelve children to William and Christina MacKay, he was determined to better himself. Too often he had heard tales of regret, of lives half lived in the bitter north. George, the Heilam Ferryman, spoke of nothing else, his plans as a young man to travel to Canada and how he was persuaded to stay by the Duke of Sutherland – this George would not make the same mistake. The third class boat train from Waterloo pulled into Southampton Docks at 09:30, stopping at 43/44 berth. Clutching a small brown suitcase and ticket 42795, George alighted into the Dockside sheds, crossed the road, controlled by a man with a red flag and momentarily stood awe-struck by the sheer overwhelming size of the ship – it was beyond anything he could have imagined. Nothing like this was ever seen in the Kyle. As a third class passenger George had a simple berth, shared with six other passengers. Keen to escape the claustrophobia of steerage and the company of strangers, many of whom could not speak English, he quickly found his way to the open decks. He was there when the ship cast off and was towed into the River Test by tugboats, there for the near collision with USMS New York, there when Cherbourg appeared on the French coast and there when the ship set sail for Cobh in the dim light of an April evening. All the while he grasped ticket 42795. It had cost £7 11s, all his savings, but he was bound for Rochester and a new life in Detroit. Of one thing he was certain, he was never going back. George’s body was never found. Created with Adobe Spark, it is also available for use on Twitter and Instagram. When I was small and Christmas trees were tall, I was easily spooked by big things. Taken to the local fire station by my grandfather, I was reduced to tears by the sheer enormity of the engines. Given the opportunity to climb Portland Lighthouse, the endless stairs sent me scurrying outside. The railway viaduct near Goostrey in Cheshire towered so high, I would not go near. In the nearby fields an enormous and strange structure was taking shape and I took exception to it. In the 1950s, Bernard Lovell’s radio telescope at Jodrell Bank was only partially complete. Many years later, living in the foothills of the Peak District at Bosley, on clear days, the entire Cheshire Plain was visible from our bedroom window. And there, at its centre, the Jodrell Bank telescope – no longer something to be feared, no longer a stranger in the landscape, it had come to define it. Around the same time in the 1950s, many miles further north, a more threatening structure was emerging from the white heat of technology. At the outbreak of the Second World War it became apparent that the air defences in the far north of Scotland must be improved, primarily as a consequence of the British Navy’s safe anchorage at Scapa Flow which was particularly vulnerable to air attack. As a first step an airfield was constructed at Wick and then later in the war, another at Dounreay. 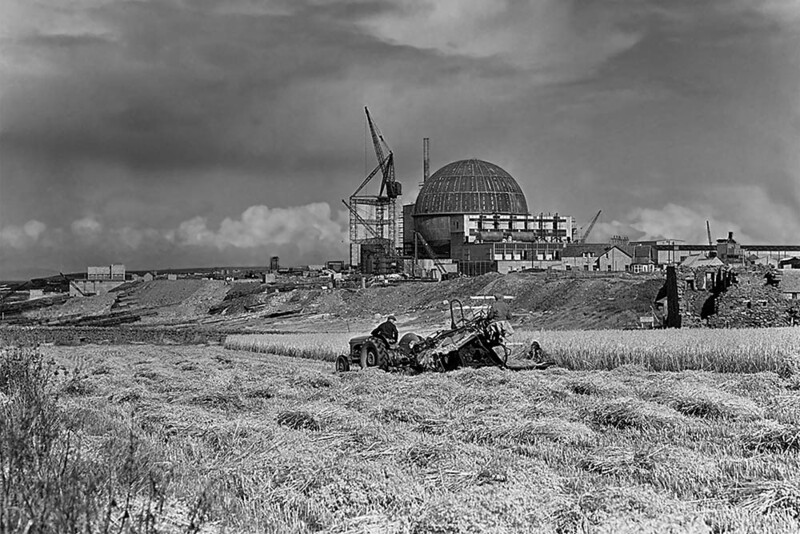 However, the Dounreay facility, not completed until April 1944, was immediately mothballed. Apart from occasional usage by the Navy as HMS Tern II and later as a camp for displaced Polish servicemen, it remained unused until 1954 when the Government announced that Dounreay was to become the centre for UK fast reactor research and development. Between 1955 and 1958, the Dounreay Fast Reactor (DFR) sphere mushroomed into the landscape and, like Jodrell Bank, it has come to define it. Lovell’s creation says ‘here we can reach for the stars’; Dounreay’s says ‘here we can tinker with the tools of Armageddon, tame Einstein’s monster’. The Caithness Death Star achieved criticality in 1959 and, in 1962, became the first fast reactor in the world to supply electricity to a national grid. Just fifteen years later it was switched off. Since then it has been a long slow process of decommissioning, an exercise that will not complete until 2025 with the demolition of the sphere. Sadly, retention is not practical – according to the Dounreay Heritage Strategy document 2010,SES(09)P007, Issue 2 : The DFR sphere is contaminated throughout and recent core samples from the vault indicate that the concrete has deteriorated more than anticipated and that original construction techniques may have been lax in some areas … despite the most rigorous decontamination efforts, the risk of receiving a significant radiation dose may never go away. I have some connection with the Dounreay site having been responsible for establishing an Office Systems field trial there between 1988 and 1989, housed in the buildings adjacent to DFR. This exercise had more to do with my love of travel and wild landscape than the practicalities of running a software trial in this faraway place. It was during one of many site visits that I was given access to the sphere, much smaller on the inside than it appears from without. Fortunately I had grown more tolerant of ‘big things’ in the intervening years. Now it is the things I can’t see that worry me, rather than the things I can. The Caithness Death Star takes shape. If, like me, you blagged your way through English at school using Letts study notes to save you the effort of actually ploughing through your Shakespeare or Jane Austen set-text, you will probably be tempted to pick up this handsome little paperback, flick it open at the chapter for your local area, scan read it to see if you recognise anyone, and put it back on the shelf. Please let me assure you; that would be a big mistake. This book deserves to be read in its entirety. Admittedly, I did start at page 103 with Robin’s arrival on Mull, but then this is not a whodunnit, so why wouldn’t I? 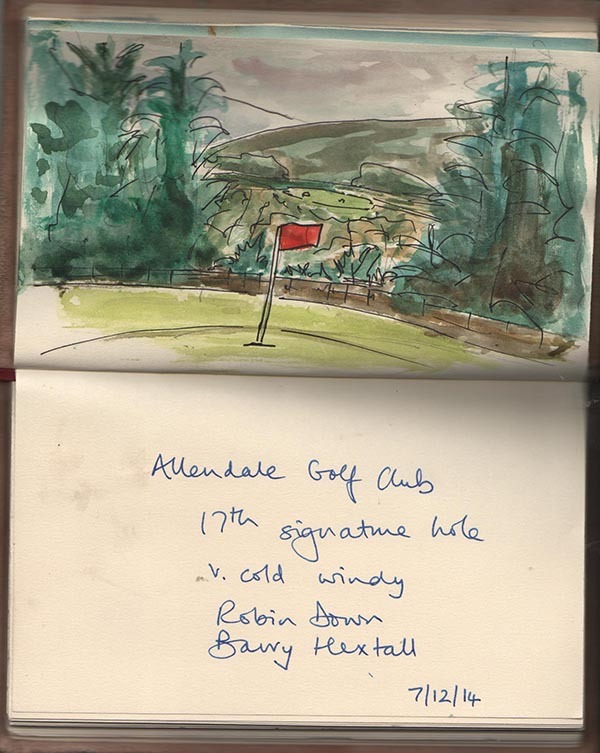 It rapidly dawns on the reader this is not a gazeeter of off-the-beaten-track golf courses, nor just another travelogue. Combining stories of local characters, history, social comment and even elements of autobiography, this delightful book will carry you along from Craignure (or wherever you choose to start) to Tobermory, then over the Sound of Mull to Kilchoan and onwards to Durness, where on completion, you’ll jump back to Allendale and find your way from there to your original departure point. 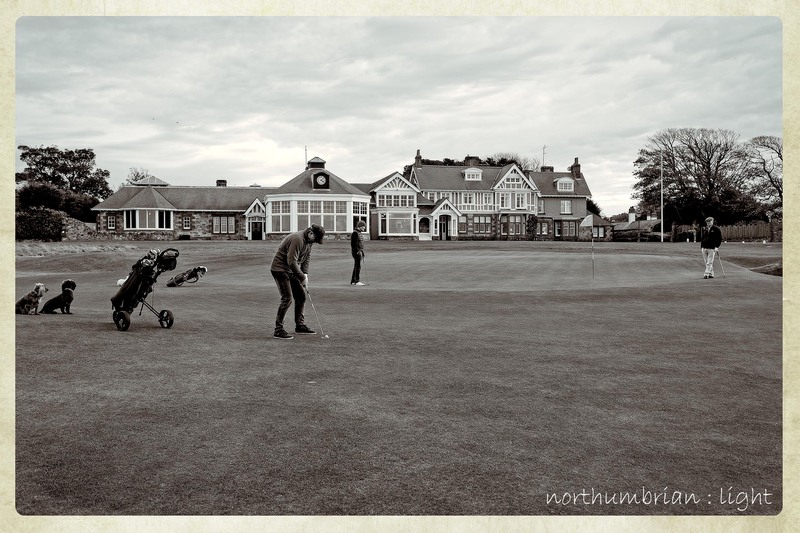 Oh yes, and he plays and writes about golf on some of Scotland’s less-well-known courses, describing his experiences in a way that the longer handicapper will surely relate to. In truth, it is difficult to say more about this book without resorting to either unnecessary hyperbole or outright pleading on behalf of the author, so let pictures paint a few words; they say never to judge a book by its cover, but maybe this is an exception. 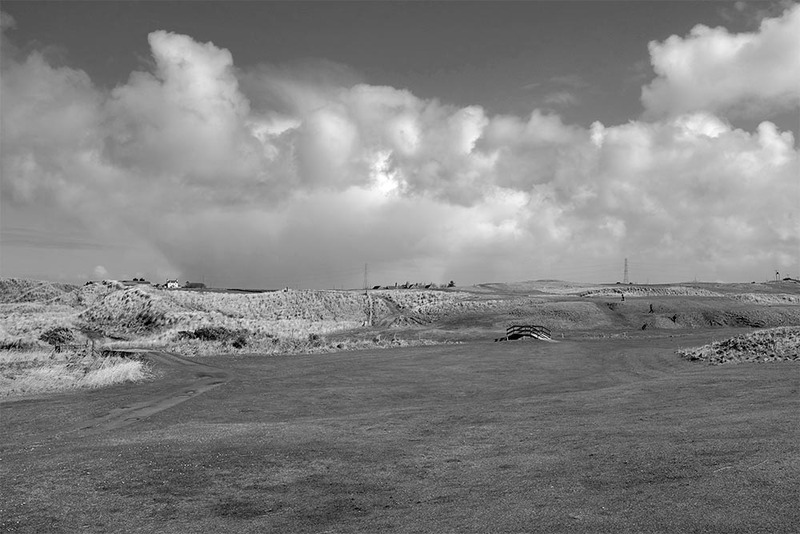 Admittedly the front cover carries a typical golf-in-the-highlands photo of the Sgurr of Eigg as seen from the third green at Traigh Golf Club near Arisaig – nothing at all wrong with that, since you ask; but flip over and look at the picture strip accompanying the synopsis on the back. There’s the Sphinx, a 1960s racing car, and Killin Railway Station in the age of steam alongside the more orthodox golf pics. Flick through the chapter heads and see the little quotes that accompany the title…Jacques Brel, da Vinci, Bob Dylan, Dickens. 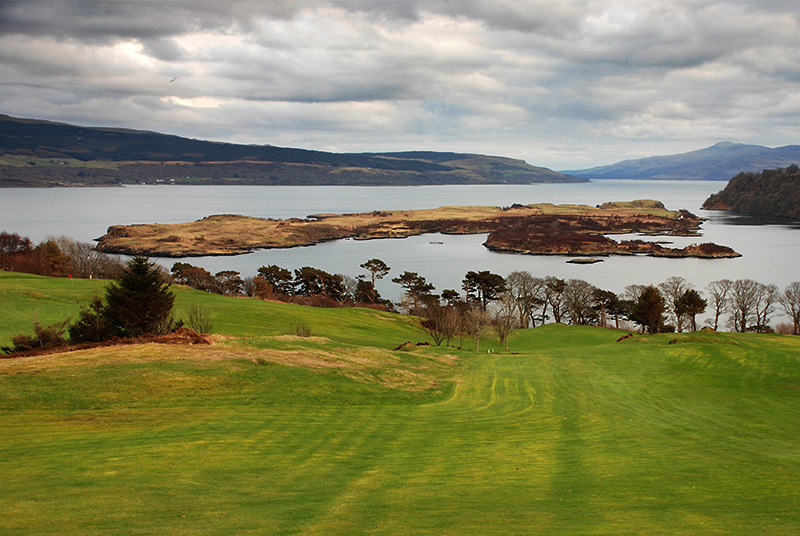 Now you’re starting to get a glimpse of where Robin Down will be taking you as you follow him on his golfing journey. “Golf in the Wild” is quirky, no doubt about it, and a right good read for golfer and non-golfer alike. Don’t put it back on that shelf.